Segmentally labelled proteins are only labelled along one section of the amino acid chain (usually the N- or C-terminal sections). Sample preparation falls into three broad categories. Native Chemical Ligation (NTL) involves the preparation of one lablled and one unlablled section of the polypetide chain using solid-phase peptide synthesis (SPPS). These two sections are then joined using chemical ligation. This method is restricted to relatively short polypeptides which can be chemically synthesised using SPPS. By contrast Expressed Protein Ligation (EPL) involves recominant expression of one or both protein halves followed by chemical ligation. Since chemical ligation would not be possible for unprotected polypeptide chains, the N-terminal fragment is expressed C-terminally fused to an intein. Attack by a thiol results in the intein being cleaved off and the N-terminal fragment forming an α-thioester. The C-terminal section meanwhile is prepared with an N-terminal cysteine. This can now attack the α-thioester and form a peptide bond between the two protein halves. 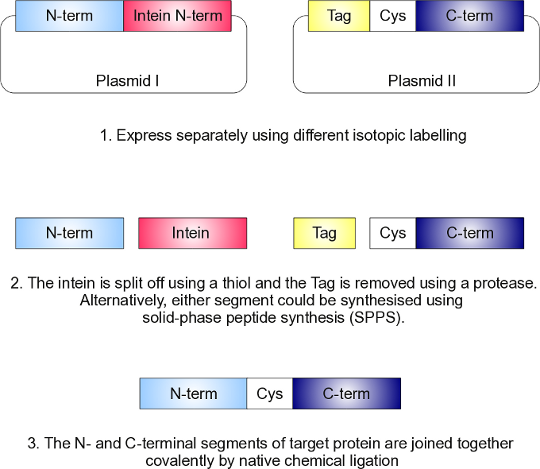 Thus the point at which the two protein segments are joined will contain a cysteine – this may have to be added to the protein sequence if there is no suitable native cystine which can be used as the dividing point. In Protein trans-Splicing (PTS) the ligation step is conducted by a functionally reconstituted split intein. An intein can covelently link the the two peptide segments flanking it, while excising itself. 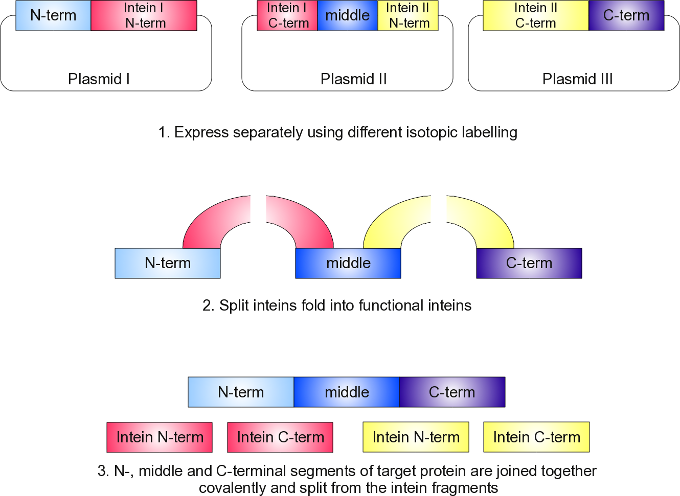 For protein trans-splicing, the N-terminal parts of the target protein and of the intein are encoded as a single peptide chain in one plasmid and are expressed. 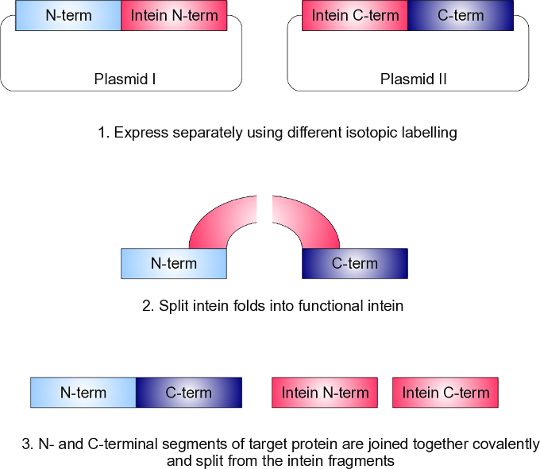 Meanwhile the C-terminal parts of the target protein and of the intein are encoded in a second plasmid and expressed separately using different isotopic labelling. When the two protein-intein chains are mixed under the correct conditions, the intein can fold into its functionally correct form and can covalently link the two target protein segments. As with EPL a Cys residue must be present at the join of the two segments. In fact, for the trans-splicing reaction to occur efficiently, the residues flanking the Cys must also be chosen carefully depending on which intein is used. If this requires mutations or insertions to the native protein, it is advisible to check that these do not significantly affect protein strucutre and function. Otomo et al. (1998) have even gone so far as to use two split inteins in order to create a protein in which only the middle segment is labelled. Segmental isotope labelling is not entirely straight forward and thus not particularly common. However, it is extremely useful for the study of multidomain proteins in which signal overlap can be reduced by isotopically labelling only one of the domains. Alternatively, it can be used to reduce signal overlap in a large protein by labelling only part of it at a time. A further application involves only labelling a small segment of a protein which is of functional interest and which can then be studied without other signals cluttering the spetra.